This is the first project I'm tackling from the "closet of shame", now renamed the "closet of overflowing creativity!" Since a studio sprucing is first on my list, this is going on one of my walls and I'd love to have it finished. It's so bright and cheery and says sewing studio to me. Before I get going on my own projects, I have bee blocks to make. To my quilting bee buddies: by the end of the weekend your blocks will be on the way. Scouts honor. I was reminded while working on the projects for the book, to savor every stitch, every opportunity to sew. That sounds a bit silly, but when I asked my blog readers why they choose handmade (in this post); it was the most inspiring set of comments I've ever had. No one, not one person said they make things because it's fast or easy. They said things like they are compelled to, it fills their soul. Words like accomplishment, satisfaction, and joy filled the comments. That "quick and easy" culture slips into the world of quilting. It's not quick or easy for me. Sometimes its damn hard, but I savor each stitch I put in or tear out. Many people tell me I work quickly, but I don't, I just work a lot. All that pent up sewing will have to wait a few more days. My hubby decided to break his shoulder over the holidays (cute story, but if I want to keep my good wife status I'm keeping it to myself!) Since his work requires him to travel and being the one armed man doesn't work very well I get to be the spouse valet. There's always an up side. I get to be with my hubby instead of home alone. I'll take my sketchbook, and pencils and be a happy camper. ooh, can't wait to see that quilty goodness you have all rolled up and ready for the book from your last post. Love that you have the spools out again! I agree that they are bright and cheery. This is from your closet of shame- er.. overflowing with creativity (love that!)??? This is really awesome. You don't want to see what's in my closet of shame! ha! Wowsers!! I have been saving selvages for awhile, but haven't settled on a pattern. Definately loving your spools. Going to have to mentally file your idea for when I get beyond my "corner of shame"!! Have fun with your hubby! Can you visit quilt stores in your valeting? :) Love the quilt top, more selvages, yeah! I can't agree with more about savoring every stitch. I'm pretty slow but I enjoy it so much. I hope you enjoy time with your husband. It's so great you can help him out in that way. Thank you for today's post, especially the bit about savoring every stitch you put in and PULL OUT! I couldn't sew without my seam ripper. Hope your husband recovers quickly. He's lucky to have you, but I'm sure he already knows that. It's obvious that you feel likewise. I'm sure you'll enjoy the time together in spite of the handicap. This is my year of tackling old projects too. I love your spools! Now that you dropped that little hint, I'm sure we're all making up much better stories about your husband breaking his shoulder than even happened. *L* I know I am. I have a serious love for that spool block!! I have been looking for a sewing themed block to make a wall hanging for my new sewing room. It sounds like you are writing a book?? Will the details be in there? Just love it! Double ouch on the shoulder break! I am glad that you are able to help him out. Love the spools to. They are so cheerful. love this one! it will certainly be a perfect addition to your sewing studio!! I love the spools! I have become enamored with all of the selvedge creativity & have even asked my friends to donate theirs (to very little acclaim). I agree with you @ the "Fast & easy" trend in quilting. Every once in awhile it's fun, but mostly I want to be challenged & grow as a quilter. That's not a fast & easy thing! I can't wait to see this one finished! Love the spools & selvage. He broke his shoulder!!?? Ouch! I'm so glad you are blogging again! enjoy your time with your hubby! I can feel your optimism from here. 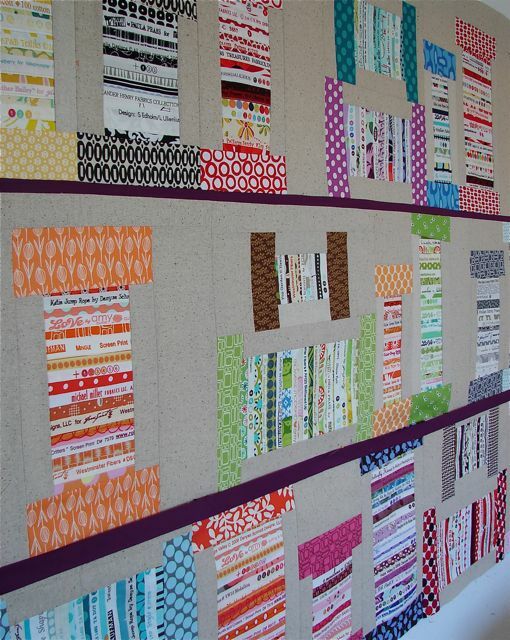 I love the spools quilt. Broke his shoulder? On top of everything else? Oh man. I hope you have some handwork for the down times. That will be a truly AMAZING wall hanging. Thanks for this reminder to appreciate every stitch. Doesn't sound a bit silly to me. Selvage spools? wiping the drool off my screen now! I'm trying to savor every stitch and remind myself that I'm doing it to feed MY sould, not to get oohs and ahs from anyone else (although that is always nice, of course!) I hope you will continue to show more pictures of your sewing room. And hope that your husband's shoulder will respond promptly and appropriately to whatever treatment he needs. I'm borrowing your enthusiasm and turning all my 'shames' into positives. Enjoy your valet role! Happy new year....looking forward to the book! I'm so glad you renamed that closet! Love your spool quilt, it is definitely a fav of mine. OUCH, poor hubby. Enjoy your time together...that's one nice way of looking at it! Agreed, quick and easy never feels as satisfying as damn hard. It feels good to hear that people are not making things to get it done "fast and easy". Love the new name for your closet! I love that you've changed the name of the closet to closet of overflowing creativity. A much better name than the previous one. The quilt on your design wall is a fave of mine. Enjoy your time with your hubby. Hope he recovers quickly. I so love the title of this post...savor every stitch--words of wisdom! yeah, that's why I make things by hand, because it keeps me busy and out of trouble! 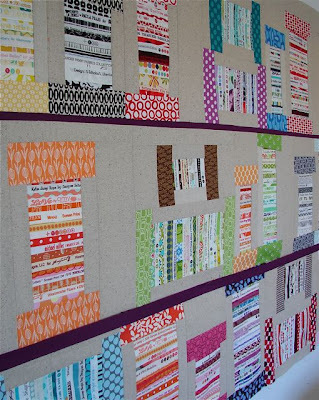 and by the way, I've always loved the spools quilt! glad it's getting some fresh air. May you find new inspiration as you serve and bless your husband! That is the noblest and most priceless opportunity presented you! May y'all stitch together fresh bonds and new joys as you share this adventure! InJoy! love this selvage project - very fresh and cool! This is a beautiful post. And I have my own "closet of overflowing creativity." I love it! Great reminders. I LOVE LOVE LOVE this selvage quilt. Seriously, it has totally inspired me. I am just now finishing up my first selvage quilt, but this is definitely going to be my next one. Thank you for sharing!